(Trent Nelson | The Salt Lake Tribune) Pleasant Grove quarterback Jake Jensen (18) hands off to Dayne Christiansen (20) as East hosts Pleasant Grove in the first round of the 6A high school football playoffs, Friday Oct. 26, 2018. (Trent Nelson | The Salt Lake Tribune) East's Tutu Spann (2) breaks free on a run as East hosts Pleasant Grove in the first round of the 6A high school football playoffs, Friday Oct. 26, 2018. 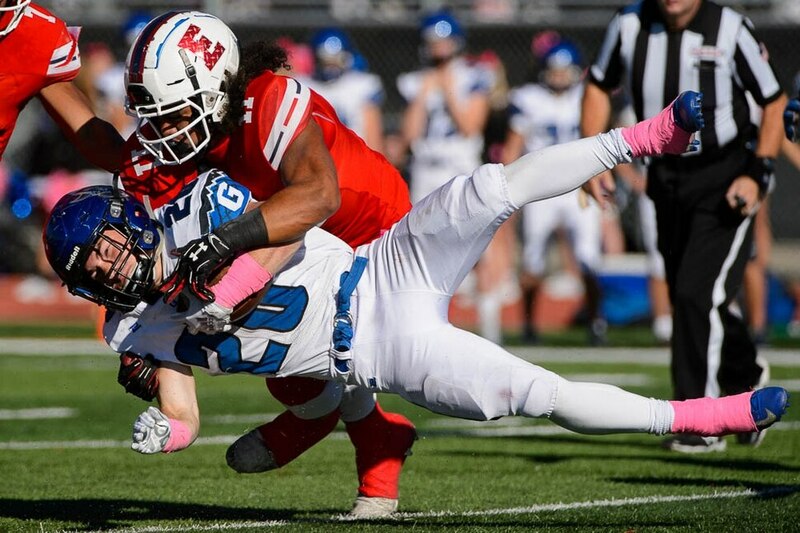 (Trent Nelson | The Salt Lake Tribune) Pleasant Grove's Dayne Christiansen (20) is tackled by East's Sione Angilau (11) as East hosts Pleasant Grove in the first round of the 6A high school football playoffs, Friday Oct. 26, 2018. (Trent Nelson | The Salt Lake Tribune) Pleasant Grove's Porter Connors leaps over East's Tutu Spann (2) as East hosts Pleasant Grove in the first round of the 6A high school football playoffs, Friday Oct. 26, 2018. (Trent Nelson | The Salt Lake Tribune) East's Charlie Vincent (21) runs for a touchdown as East hosts Pleasant Grove in the first round of the 6A high school football playoffs, Friday Oct. 26, 2018. (Trent Nelson | The Salt Lake Tribune) Pleasant Grove's Dayne Christiansen (20) runs the ball as East hosts Pleasant Grove in the first round of the 6A high school football playoffs, Friday Oct. 26, 2018. 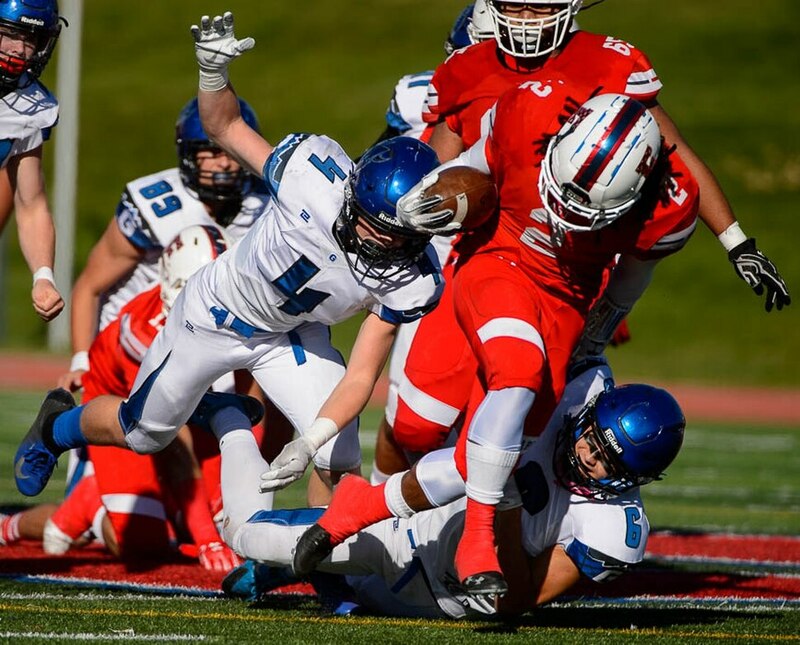 (Trent Nelson | The Salt Lake Tribune) East's Charlie Vincent (21) runs for a touchdown as East hosts Pleasant Grove in the first round of the 6A high school football playoffs, Friday Oct. 26, 2018. (Trent Nelson | The Salt Lake Tribune) Pleasant Grove quarterback Jake Jensen (18) is tackled as East hosts Pleasant Grove in the first round of the 6A high school football playoffs, Friday Oct. 26, 2018. (Trent Nelson | The Salt Lake Tribune) East's Charlie Vincent (21) runs the ball as East hosts Pleasant Grove in the first round of the 6A high school football playoffs, Friday Oct. 26, 2018. (Trent Nelson | The Salt Lake Tribune) East's Tutu Spann (2) runs the ball as East hosts Pleasant Grove in the first round of the 6A high school football playoffs, Friday Oct. 26, 2018. (Trent Nelson | The Salt Lake Tribune) East's Charlie Vincent (21) runs for a touchdown as East hosts Pleasant Grove in the first round of the 6A high school football playoffs, Friday Oct. 26, 2018. One by one, players from the East High School football team slowly emerged from their locker room. Some still dressed in full pads and helmets, others carrying their pads in their hands. All of them wore faces of despair. Some had tears streaming down their face as they embraced friends and family. As supporters waited for them, a somber mood filled the atmosphere. It’s the type of feeling that overcomes a situation when something that wasn’t supposed to happen, does. The Pleasant Grove Vikings, on the other hand, jumped up and down as the final buzzer sounded after their 27-21 win over East on Friday to advance to the quarterfinal round of the USHAA Class 6A state championships. The entire team rushed out to the field in ecstasy. It was only a first-round win, but the celebration was indicative the feeling that overcomes a situation when something that wasn’t supposed to happen, does. East came into Friday’s game the better team. It had the better record. It had the most momentum. But what it did not have was star senior quarterback Josh Glad, who injured his leg in a game last week. East head coach Brandon Matich said not having Glad in the lineup did not make a difference in the game’s outcome. “It’s unfortunate for the kid, but it’s a team game,” Matich said. What did make a difference was how Pleasant Grove countered every one of East’s punches. The Leopards scored first on a 68-yard touchdown from senior running back Charlie Vincent, but they missed the extra point. 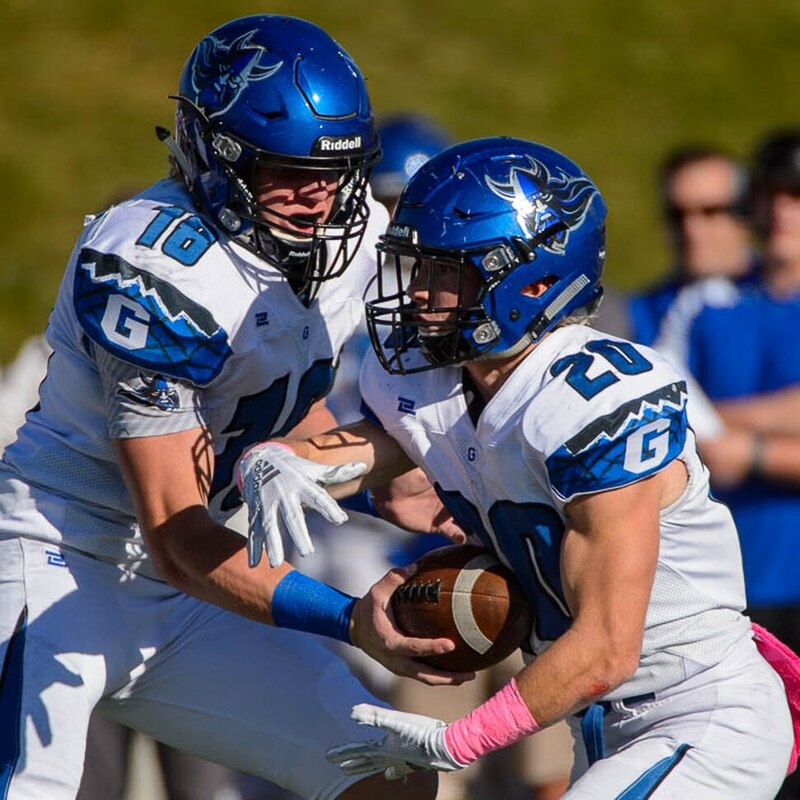 The Vikings answered with a 10-yard pass from senior quarterback Jake Jensen to senior running back Dayne Christiansen, and Pleasant Grove did make the extra point for a 7-6 lead. Just before halftime, the Vikings led 14-6. East’s sophomore quarterback, Izaak Zimmerman, passed to Vincent for a 47-yard touchdown with 47 seconds left in the first half. But back came Pleasant Grove in the third quarter, this time with a trick play. Jensen handed off to Christiansen, who pitched backward to Jensen, who then launched a deep ball to Easton Fowler for the touchdown. The Leopards tied the game at 21 apiece after senior running back Tutu Spann scored a 1-yard rushing touchdown and Vincent ran in the 2-point conversion with less than four minutes left in the third quarter. The Vikings, however, made the last stand. Despite East stopping Pleasant Grove from reaching the end zone on two separate drives late in the fourth quarter, Carson Ecalono converted two field goals to give the Vikings a 27-21 lead with 6:38 remaining in the game. East had an opportunity to at least tie the game late. It was only 23 yards from the end zone with less than 2 minutes remaining, but Pleasant Grove’s defense kept the Leopards at bay. On fourth-and-3, it initially appeared that Spann got the first down, but the chains revealed otherwise with 1:19 left. “I thought our defense really stepped up tonight to hold them to what he held them to,” Wootton said. Jensen threw all the touchdown passes for Pleasant Grove, and all were to different receivers. It was his first game back after missing the last three with a dislocated left shoulder. Matich was visibly upset after the game. He said there were “several little factors” that pointed to East’s loss. The Vikings on Nov. 2 will play Fremont.